So after driving from Costa Mesa all the way up to Glendale to sell my bro's car, I quietly coaxed my ride home into stopping by the Torrance Mitsuwa for a "scary surprise." Little did I know that the "scary surprise" was an $18 ramen! $18 good lord that's a lot of money!! This better be worth it. 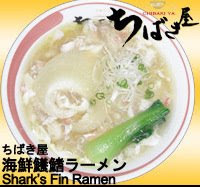 Shark's Fin Ramen: I still can't believe this ramen cost $18. Can you? I'll just get straight to it. It was good, but to me not worth the $18. Don't get me wrong, the soup was delicious, although its とろみ was a little strange and disturbing for ramen. It tasted just like Shark's Fin soup I've had at the local Chinese Restaurant only it had noodles. I'm not sure how authentic it really is, but I felt a bit guilty eating it. The toppings (shark's fin, bok choy, hints of crab, onions, and probably some other stuff) were fitting for this ramen. For $18 though, it could've used a bigger bowl. I wonder how shark's fin ends up looking like this...nevermind I don't wanna know. The noodles were really good. I would pay $18 for a case of these noodles. I took some takoyaki home and they were well worth it! Highly recommended! For more info on the rest of the Torrance vendors you can read a detailed review of fellow blogger ExileKiss here. Thanks ExileKiss! Your reviews were great too. I hope you don't mind me linking to your pages for the detail on the other stuff besides ramen. I'm glad they had the fair too. I spent 3 hours on Saturday at CM again and it felt good to show my non-Japanese friend's a little taste of Japan. Can't wait until next year! Doumo. :) I don't mind at all. Thanks for the link!